ith temperatures rising across the province, the BC SPCA is reminding the public to protect their pets against the dangers of heat exhaustion and heatstroke. "When the days get warmer we get hundreds of emergency calls to rescue dogs whose lives are endangered because they are left in hot cars by their guardians," says Lorie Chortyk, general manager of community relations for the BC SPCA. 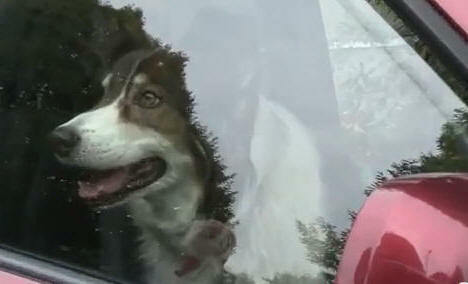 "Many well-meaning guardians leave their dogs unattended in parked cars while they run errands. Tragically, this can lead to serious heatstroke and even death for their pets." The temperature in a parked car, even in the shade with windows partly open, can rapidly reach a level that will seriously harm or even kill a pet. In just minutes, the temperature in a parked car can climb to well over 38 degrees Celsius (100 degrees Fahrenheit). Dogs have no sweat glands, so they cool themselves by panting and by releasing heat through their paws. On summer days the hot air and upholstery in a vehicle can make it impossible for pets to cool themselves. Dogs can withstand high temperatures for only a very short time - usually just 10 minutes - before suffering irreparable brain damage or death. • Fan vigorously to promote evaporation. This will cool the blood, which reduces the animal's core temperature. • Do not apply ice. This constricts blood flow, which will inhibit cooling. • Take the dog to a veterinarian as soon as possible for further treatment. "If you're used to letting your dog accompany you on errands, you might feel guilty leaving him behind on hot days. But your dog will be much happier — and safer — at home, with shade and plenty of fresh cool water," Chortyk says. Watch a 1 minute video clip from the BC SPCA here.